Clément-Théodule-Germain Ribot, known simply as Germain Ribot, remains an enigma to most researchers. He came from a family of artists and was the son of a very private and independent painter, Augustin-Théodule Ribot, which consequently left few clues as to the details of his life. What is known about this artist, while scant, shows that Germain emerged from beneath his father’s shadow to gain entrance into the art world of Paris, taking part in several Salon exhibitions from 1870-1883. His still life arrangements became part of an important still life movement in France that had been increasing in popularity and importance since the time of Jean-Baptiste-Siméon Chardin in the eighteenth century. Germain Ribot was born in Paris on May 31, 1845. He began his artistic training under his father, a genre painter and etcher who also painted historical scenes, portraits, and “nature morte”, or still lives. Germain later studied under Antoine Vollon (1833-1900), another important painter of the period and friend of Théodule. While Germain’s father showed a diverse repertoire of subjects ranging from historical compositions to still lives, Germain focused his attention on perfecting his own still life paintings. Nevertheless, the artists may have collaborated which makes it difficult to establish a specific style for each individual. While it is apparent that Germain was influenced by his father’s dark palette at the beginning of his career, his paintings increasingly became dominated with bright colors, reminiscent of the still lives of Henri Fantin-Latour. Still life compositions were in high demand during the period in which Germain worked. This demand had been nurtured by a revival of this type of painting from the 1850’s onward, stimulated notably with the influence of Jean-Baptiste-Siméon Chardin’s still lives on the public and at the Salons. Germain’s paintings spoke to a middle-class clientele searching for decorative paintings for their homes. Many of his still lives showed abundant groups of flowers painted fairly loosely and set against a dark background so as to emphasize the effects of light on the petals more than their linear definition. Germain worked to present simple, everyday objects and arrangements as a freely composed piece of work and of a subject matter that was accessible to his patrons. Germain debuted at the 1870 Salon with Sciences and Arts: Nature Morte (Still Life: Science and the Arts), and Les Vases: Nature Morte (Still Life: Vases). During this point in his career his father was his teacher. This was a notable year for the Salon as there were 5,434 works entered -- 1,194 entries more than the Salon of 1869 and 2,689 more than 1867. It was a competitive time to debut your work at the Salon just at the moment when the Second Empire was ending. 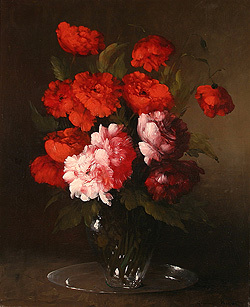 Germain did not exhibit again until his Fleurs (Flowers) at the Salon of 1875. His father, Théodule, still noted as his teacher, exhibited as well. Between 1875 and 1876 Germain, according to listings in Salon catalogs, may have moved from an area along the Seine, at Colombes, where he was living with his father, to 12 Avenue des Tilleuls, in Montmartre. Montmartre was the Parisian center of the artistic bohemia. Germain must have been between 30 or 31 years of age at this point, perhaps moving to begin his own artistic career outside of the shadow of his well-known father. This same year, 1876, Germain exhibited two works at the Salon: Vases et Fruits (Vases and Fruit) and Nature Morte (Still Life) -- no further explication given. At the Salon of 1877 Germain (exhibiting Un Livre de Grandville, A book of Grandville), his father, and his sister, exhibited togeth er for the first time. Germain is listed as having residence at 11 Rue des Moines, Batignolles, his second move, while his sister remained with their father. That each family member was represented at the Salon is an interesting point and shows a family working closely together in a sort of artistic workshop, with each establishing their own identity by exhibiting at the Salon. Germain’s entry for the Salon of 1879 was a Portrait, a divergence from his usual submissions. The title, Portrait de M.S.M.…, Secrétaire de M.G.,… deputé (Portrait of M.S.M.…, Secretary of M.G.,…deputy), as noted in the catalogue, does not provide further information on who the sitter might have been. Germain was now residing at 9 Rue Poultier in the Île Saint-Louis. Between 1879 and 1880, Germain moved from the Rue Poultier to 45 Rue La Croix, Batignolles, and began studying under another painter, Antoine Vollon. Two years later in 1882, Germain, his sister, and father, exhibited together for the last time, Germain showing Nature morte (Still Life), a work of which nothing is known. By this time he was no longer under the tutelage of Antoine Vollon, showing that their studies together were brief. In 1883, Germain moved back in with his father and exhibited alone at the Salon, showing Etains du seizième siècle (Sixteenth Century Pewter). Germain Ribot disappeared from the Salon art scene after returning to live with his father; his last exhibition was in 1883. This is still a decade before his death and raises the question of what Germain was working on during this period, adding to the enigma that was Germain’s life. It has been suggested (Gabriel P. Weisberg, “Théodule Ribot’s Still life with eggs and the practice of still-life painting in the late 19th century”, Van Gogh Museum Journal, 1997-98) that Théodule Ribot was in poor health which may have forced him to have his children work alongside him. This would also explain Germain’s disappearance from the Salon scene and his move back home in 1883. Still, much of Germain’s life remains speculation. He died at an early age in Argenteuil on April 17, 1893, just two years after his father. The Cleveland Museum of Art owns Still Life with Dead Birds and a Basket of Oysters, but many of Germain Ribot’s works have yet to be identified or are in private collections.